Pay securely by Paypal Business; no registration required, simply click 'Checkout as guest'. To pay by cheque, send a cheque for the full amount including postage(made payable to David Ainsworth) to the address at the bottom of the page together with your name, address, and order request. OUR LONGEST AND MOST ACTION-PACKED RELEASE TO DATE! 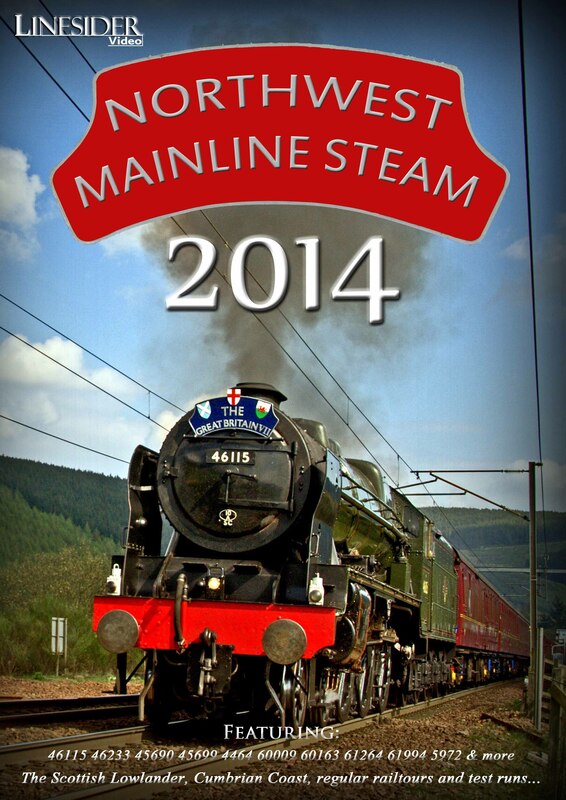 Northwest Mainline Steam 2014 is the latest in our successful series of DVDs, featuring a wide variety of motive power over the region’s routes and major climbs, covering the area from Preston in the south to Gargrave and Skipton in the East, and Glenfinnan in the North. All material was shot in High Definition and the DVD includes on-screen details of railtours, locations and dates and gradients. As ever, a minimal commentary is timed to avoid conflict with the sounds of the locomotives. 46115 Scots Guardsman Stunning performances on Shap early in the year, including footage at Grayrigg Summit, Scout Green (multiple camera angles) and Shap Summit. Also included are shots of her at Ais Gill and Garsdale, together with extensive coverage of its southbound run over the Cumbrian Coast in April, and northbound run with the Great Britain VII later that month (following a shot of 44932 crossing the Kent Viaduct and arriving at Grange), together with blitzing Beattock later in its epic journey to Edinburgh. Later in the year, we see it at work on the Lune Rivers Trust Special over the Settle & Carlisle railway. Extensive coverage of The Scottish Lowlander tour including footage of 46233 on Shap (2 locations), 60009 on Beattock (2 locations), leaving Abington, and at Carstairs, and of the return over the G&SW at Drumlanrig. 46233 is then captured tearing through Penrith (2) and 45699 taking the final leg through Lancaster. Also included are contemporary scenes of the Waverley Route. 46233 Duchess of Sutherland Classic Pacific power over the S&C and Shap, seen at Gregson Lane (2), Dent Station, Shap Summit (2), Brock (3) and Preston Station (August 30th); Swanside, Stainforth, Kirkby Stephen, Birkett Common, Pleasington (September 6th), and Stainforth and Horton on October 12th. Her run from Crewe to Polmont on September 12th is extensively covered with shots at Brock (2), Scout Green, Shap Summit, Sark Viaduct, Kirkpatrick Fleming, and climbing Beattock in the dark (3). 4464 Bittern A rare visit to the region, seen on the WCML - including a fabricated shot of her chasing the diesel-hauled leg of the journey at Greenholme, and at Kirkby Stephen on the S&C on the return. 48151 45699 & 46115 An incredible triple-headed ECS working, seen at Gargrave, Hellifield, Giggleswick and Giggleswick Summit. 5972 Olton Hall Extensive coverage of the GWR Hall’s final runs over the Little N. Western, with shots at Clapham (2), Hellifield, Skipton (2), Hellifield, Giggleswick Bank (on the first run), and Clapham, and Giggleswick Summit on the final run. 60163 Tornado Footage of the A1’s impressive southbound run over Shap in superb conditions, seen at 4 locations. 62005 K1 action on the West Highland line at Glenfinnan Viaduct and Summit, and Loch Nan Uamh viaduct. 48151 Impressive 8F performances over Wilpshire on the Fellsman (without any diesel assistance, 2 locations) and blitzing Shap on the Cumbrian Coast Express (2 locations, including the summit). Later in it journey it is seen near Harrington from multiple coastal vantage points, and tackling Lindal Bank in style. 60009 Union of South Africa Seen on Cumbrian Mountain Express duties on Shap & the S&C, including an unscheduled safety check at Woodacre near Garstang. 45231 The Sherwood Forester Coverage of an unassisted Fellsman run in late summer, seen at Brock, Whalley arches, Gisburn, Stainforth, Helwith Bridge, Dent Head, Mallerstang, Ais Gill, Barton and Lancaster. 61994 The Great Marquess Action over Shap and Beattock on September’s West Highlander, seen at Scout Green (2), Metal Bridge, and climbing Beattock (2). 45690 Leander The return of the ever-popular Jubilee on its loaded test run in late October, seen near Clapham, at Hellifield and Pleasington.